English Lawyer Cecil Chubb snagged #Stonehenge for just £6600 100 years ago. Given it was on the market 16 years earlier for £125,000, lawyer Cecil Chubb bagged a bargain when he picked up Stonehenge at a 1915 auction for £6600, two years after Druids cursed the relic’s owner. First angering Druid worshippers by building a fence and charging admission, in 1913 Edmund Antrobus, whose family bought 525ha on Salisbury Plain around Stonehenge in 1824, banned Druid solstice celebrations in 1913. Druid leader Macgregor Reid called down a “kara” on Antrobus, chanting “in grief and sorrow I call down the curse of Almighty God”. Antrobus died at 67 in February 1915, four months after his only son, Edmund Jr, 28, perished on Belgian battlefields. A Grenadier Guards lieutenant, he died fighting Germans on October 24, 1914, and was buried in an orchard in a village outside Ypres. Estate agents Knight, Franck and Rutley put the historic site under the hammer at Salibury’s Palace Theatre on September 21, 1915. Chubb placed the winning bid for “Lot 15: Stonehenge with 30 acres of adjoining land”. Sir Cecil Chubb purchased the Stonehenge site in 1915. Chubb reportedly placed the bid on a whim, either to purchase the site as a gift for his wife or because be believed a “Salisbury man ought to buy it”. Chubb was born in 1876 at Shrewton, 6km west of Stonehenge, to saddler Alfred and his wife Mary. He attended Bishop Wordsworth’s School in Salisbury, working as a student teacher from age 14, when he met his future wife Mary Finch at a school cricket game. Chubb earned a double first in science and law at Christ’s College, Cambridge and in 1902 married Mary, whose uncle Corbin Finch owned Fisherton House mental asylum. After Finch’s death in 1905, the business and buildings were transferred to Mary. A limited company ran the hospital in 1924, with Chubb, then Sir Cecil, as chairman. Under his management it became Europe’s largest private mental hospital. He also served on Salisbury City Council, became a successful racehorse owner and cattle breeder. An 1800 engraving of Stonehenge. Stonehenge ownership records date to at least 1620, when a “Mr Newdick”, probably Robert Newdyk who bought land at Amesbury, Wiltshire, in 1614, refused “any offer from George, Duke of Buckingham”. Amesbury, 3km east of Stonehenge, is the oldest continuously occupied site in Britain, dating to 8820BC. By 1639 Stonehenge had passed to knight Laurence Washington. His friend, architect Inigo Jones visited to write in 1665 of “the most notable Antiquity of Great Britain, vulgarly called Stonehenge”. When antiquarian William Stuckley described walking “hard and dry, chalky soil” in 1740 in “Stonehenge, A Temple Restor’d to the British Druids”, it stood “in the lordship of … Armesbury, the possession of Rev Mr Thomas Hayward … the Arch-Druid of the Island”. It belonged to William, Duke of Queensberry, in 1778, passing on his death in 1810 to Archibald, Lord Douglas, who in 1824 sold the Amesbury estates to Cheshire baronet Edmund Antrobus. His great-nephew Edmund, 4th Baronet and former Grenadier Guards colonel, put Stonehenge on the market in September, 1899. 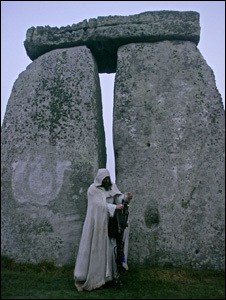 Druids at Stonehenge in 1998. Today the ancient site attracts millions of visitors from all over the world. 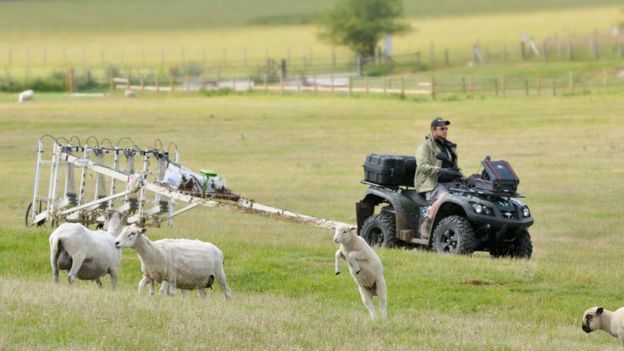 But the Spectator suggested a value of £25,000, allowing “£10 an acre for the land, which from an agricultural point of view is probably the worst in England and … the remoteness of Stonehenge from the beaten tracks of tourists and sightseers”, encouraging few visitors. The government refused, so in 1901 Antrobus enclosed Stonehenge and charged 1 shilling, or about £5, admission. Some 700 brothers joined an Ancient Order of Druids ceremony at Stonehenge in August, 1905, when Antrobus was inducted into the society. In June, 1912, Reid led his Universal Bond of Zoroastrian-inspired Druids in “Sun-worship at Stonehenge”. Antrobus banned the gathering in 1913, when police attempted to stop Reid entering the site. He clashed with police again at the 1914 solstice. Chubb, who died in 1934, permitted Druid celebrations before donating Stonehenge to the British nation in October, 1918. The tour is followed by a light lunch at the Museum and minibus transport to the start of the walk, if required. 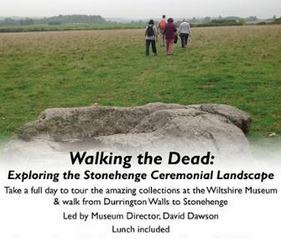 At about 5.30pm, at the end of the walk, there will be minibus transport back to your car at the start of the walk, or back to the Wiltshire Museum in Devizes. 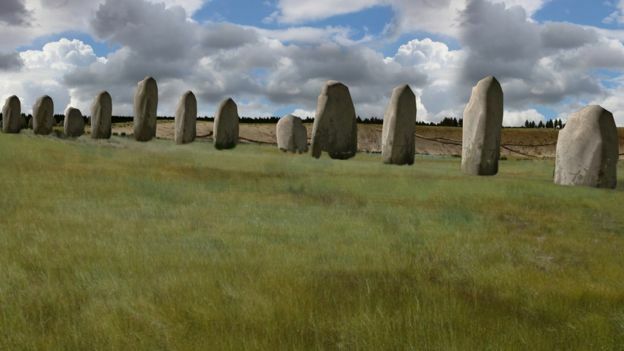 Standing stones found buried near Stonehenge could be the “largest” intact prehistoric monument ever built in Britain, archaeologists believe. Using ground-penetrating radar, some 100 stones were found at the Durrington Walls “superhenge”, a later bank built close to Stonehenge. The Stonehenge Living Landscapes team has been researching the ancient monument site in a five-year project. Finding the stones was “fantastically lucky”, researchers said. The stones may have originally measured up to 4.5m (14ft) in height and had been pushed over the edge of Durrington Walls. 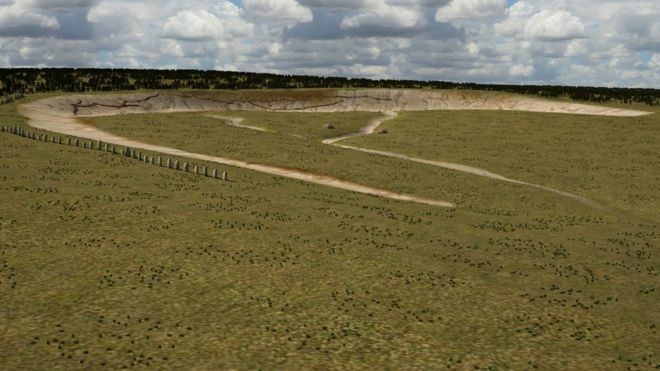 The site, which is thought to have been built about 4,500 years ago, is about 1.8 miles (3km) from Stonehenge, Wiltshire. The stones were found on the edge of the Durrington Walls “henge”, or bank, an area which had not yet been studied by researchers. Lead researcher, Vince Gaffney said the stones were “lost to archaeology” but found thanks to modern technology. National Trust archaeologist, Dr Nick Snashall said there were “hints” the stones could be buried in the landscape. “In the field that lies to the south we know there’s a standing stone which is now the only standing stone, now fallen, that you can go up to and touch in the whole of the Stonehenge landscape,” he said. “It’s called the Cuckoo Stone. 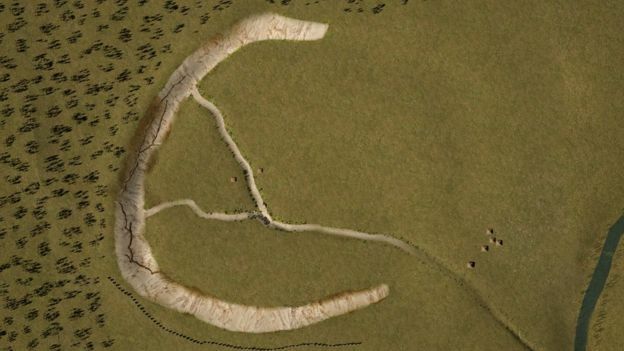 Dr Snashall added there was a “sense” of an area set aside for the living and another for the dead at Durrington Walls – and that had changed over time. “This gives us a a whole new phase that shows us that has started within 40 years of the site going out of use, or even less than that,” he said. The findings are being announced later on the first day of the British Science Festival being held at the University of Bradford.